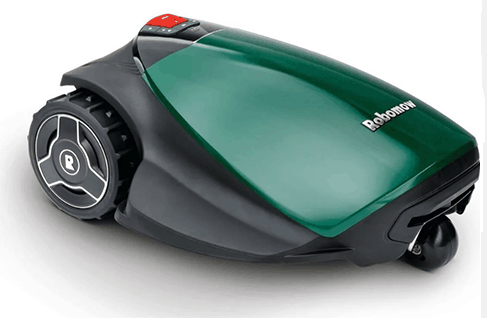 The Robomow RC308 is seen as a mid-range model, with its closest and most similar competitors being the Bosch Indego 800 and the Worx WG790E. All can cover areas reaching 800m² and all are in the same price bracket. 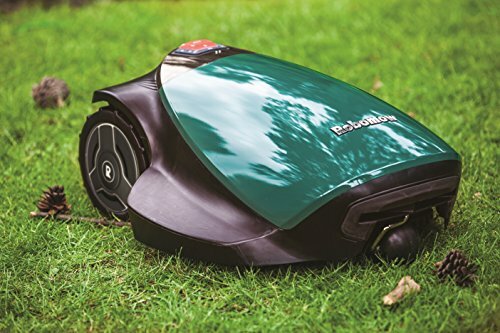 The RC308 comes with all the basics you’d expect from one of Robomows models – such as the same safety features, charging system & installation process – but it also has some more unique features too, including a wide cut, mobile phone control and the ability to mow in separate garden areas. To get the full scoop on all its features, functions and capabilities make sure you stick around as I’ll be analysing them all throughout this review. 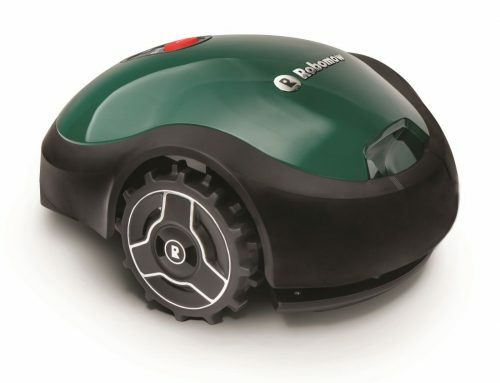 The Robomow RC308 is powered by a 26V Lithium battery and electric motor. Which produces a charging times of 60 – 90 minutes and a working time of 60 – 73 minutes. Now this may not be the most efficient model out there right now but is still quite impressive. 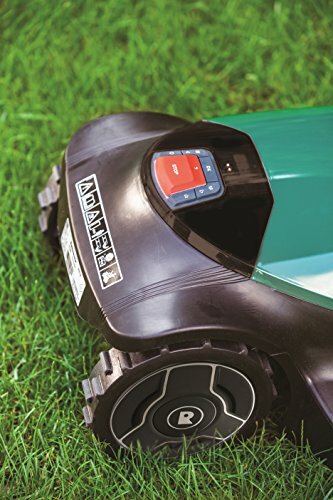 But to speed up the whole process, the RC308 does have one of the largest cutting blade in within its market (medium sized lawns) with a mowing width of 11 inch (28cm). 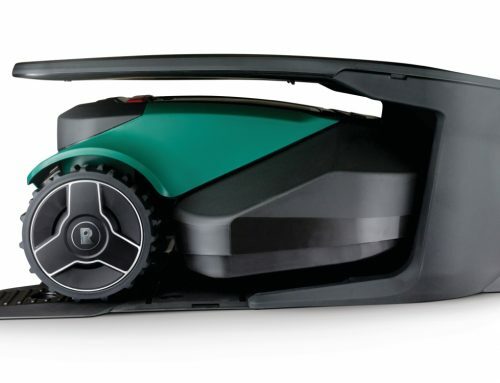 Meaning it can cover up almost twice as much ground as the common robotic lawnmower in a straight line. However you could see this as both a good or a bad thing. For the purposes of cutting grass of course it is a good thing, you get more grass cut!, but from a safety point of view, it could be a little more dangerous. The larger blade means it’s close to its edges, putting you in a little more risk when trying to lift it up. But to be fair, I’m probably just being too cautious. The bot does come with a quick stop blade function which is activated immediately after being lifted or tilted, and there is still some room to fit your fingers so the blade should do no damage. Although if I was you, I would still act carefully. 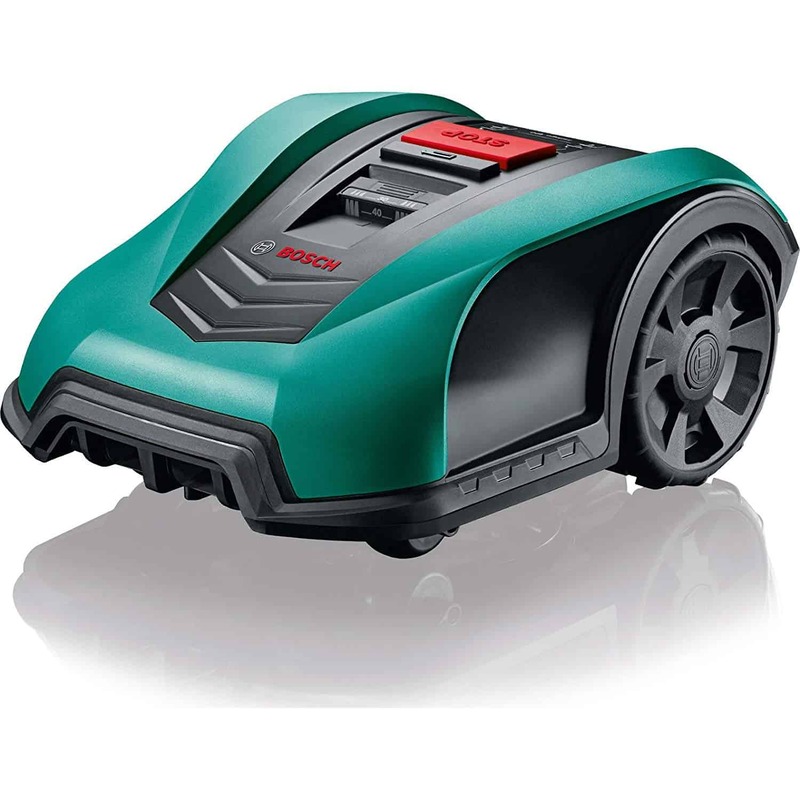 Like all automowers, the RC308 has its own docking station which it leads itself back automatically to recharge. 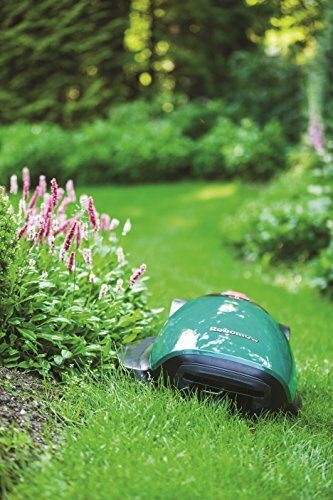 Unlike others, the RC308’s docking station can be placed external to the mowing area. A very useful touch to make sure your dock out of plain sight, for example under a hedge or decking. So instead of focusing on the mower, everyone will be focused on your beautifully cut garden! In order for this mower to work properly around your lawn, you need to ensure that there is at least 2m of space between one length of perimeter wire and another. Just make sure you keep this in mind before purchase. If you have any areas of lawn which are narrower than this then the RC308 will not even be able to pass through here, nevermind mow it. The RC308 has a weight of just over 10kg and dimensions of 64x46x21 cm. 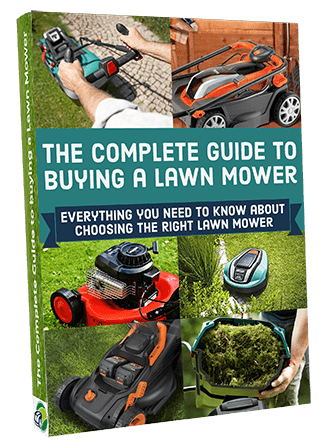 Meaning it’s not the lightest mower in the market but it shouldn’t cause any hassle to anyone carrying it – which you won’t have to do very often! For those with slopped lawns you need not worry, the RC308 can work on ground reaching 20° in slope. Even though some models in the market struggle with this, the RC308 deals with them just fine. But you might have to watch out for little steep bumps or holes in the garden. This bot, like most other, has a hard time with these and can sometimes get stuck. The RC308 has a number of settings to be used in different environments. Depending on the situation and time of year, you can change the RC308 settings so that it is better equipped to handle the task. This tells the mower to work and spin its blades at a much quicker rate. It’s best suited to times where your grass has grown out a little too long, like in the beginning of spring. A very nice feature which is not used by competitors. Just remember this can only be done for a short period of time however, because it uses up quite a bit of energy. 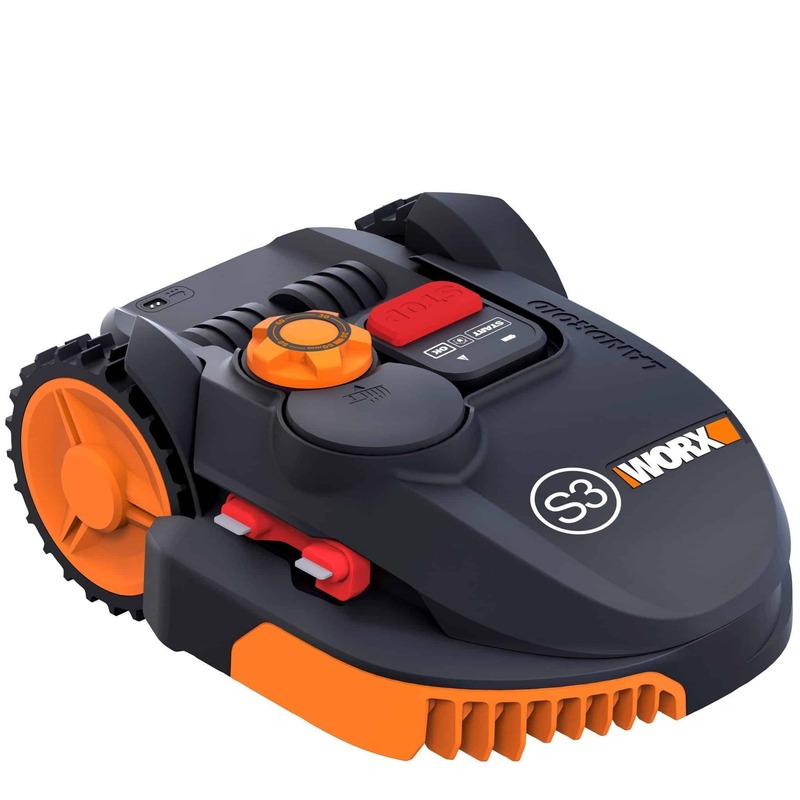 The RC308 can operate using minimal energy for cutting your grass and maintaining your garden. Which help to keep the overall costs of housing a robomower down. However be warned, this does slow down the RC308s work rate so will take longer to finish the mow. This is probably the most useful of all modes. This program instructs the RC308 to follow the perimeter wire and cut the borders of your garden. 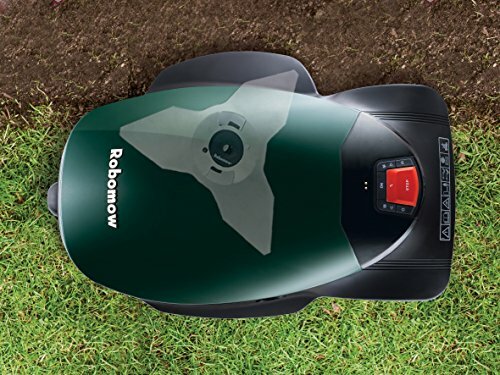 Meaning this is the only robomower that can actually reach out and cut the outer limits of your garden. So they’ve came the closest to completely removing you from the garden. All of these modes automatically turn off and reset to regular cutting after one complete cycle. Robomow have also fitted the RC308 with a rain sensor. This prevents the mower from going out and instructs it to come back in whenever it begins to rain. Stopping it from causing any damage to your lawn and protects it from any electrical problems. Once the rain has stopped, it will then return to the last place it left off to continue mowing. The mowers sensitivity to the rain can also be adjusted so that it the slightest bit of rain doesn’t set it off. Probably the most unique and most useful ability of the RC308 is it can operate in three separate areas automatically. 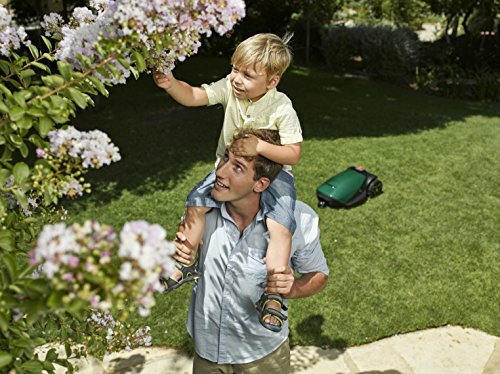 Due to its power wheels (70% wider than most) it can travel on any terrain – like your patio for example. So it can travel from your front garden to back garden or any other area without any input from you. You will need to do a little more work during the installation process but that shouldn’t be too much hassle (or extra hassle). Just like everywhere else, you need to lay down the perimeter wire and make sure everything is connected. This does mean you’ll need some sort of passage way joining each area which the mower can drive on. Otherwise you’ll still need to carry it. Nonetheless this is a great feature that, if you have the garden, will save quite a bit of time and effort. The app is not only cool but practical. It helps those most with an active lifestyle, or those who just love the techy side of things. It doesn’t really matter, I just know you’ll love it anyway. With it you can do all the expected stuff like control the mowing pattern, cutting schedule and cutting height. 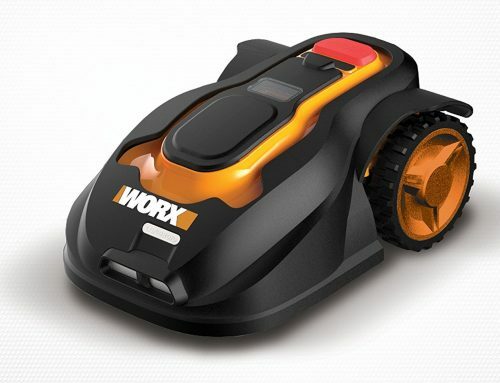 But as an extra special add-on you can actually control the mower just like a toy car. So if you have any sections of your lawn that are particularly tricky, you can do it yourself. 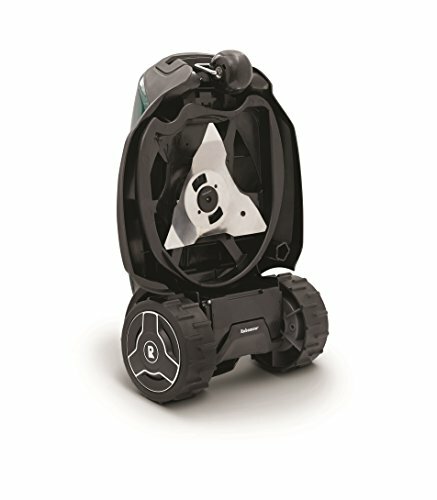 The RC308 has all the common safety features that you would see on any other Robomow robot (and any other automower for that matter). This ensures that anyone without a code can’t access and operate the mower. If they try (and do so unsuccessfully) the alarm will go off and the mower will send a notification to your phone. 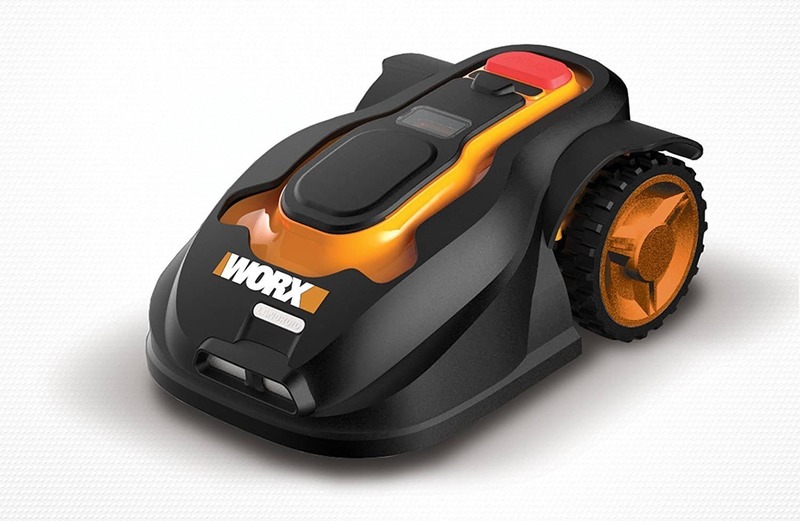 To stop the RC308 causing any damage to things in your garden and to itself, it’s accompanied with bump sensors. 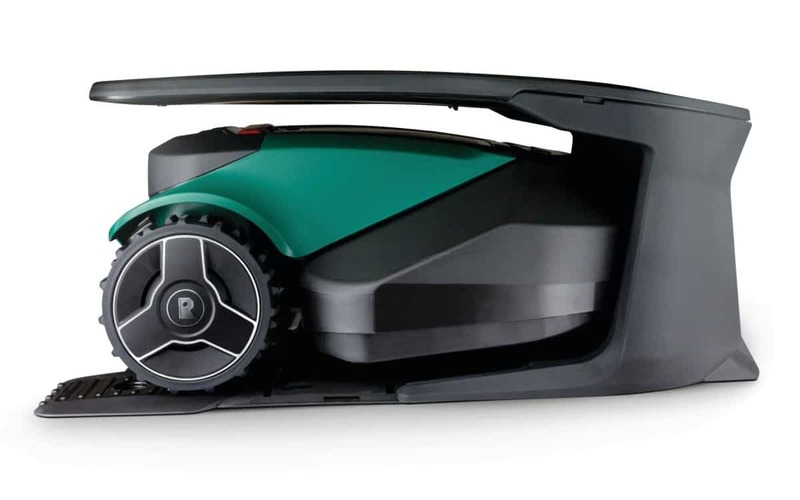 So whenever it does bump into an obstacle, it’ll quickly stop, turn off its blade, rotate in a different direction and continue mowing using a different route. But in the off chance something does go wrong, the RC308 has a stop button (red button in picture) you can use manually. Whenever the mower is lifted up or tilted, these automatically stop the blades from spinning immediately. So if you have to change the blade or just want to show it off to some friends, then you should be fine. But just make sure to do so cautiously, you’re still dealing with a blade. Okay there are a few problems with this mower. The mower can’t travel over ledges. This is probably obvious, but if the mower were to drive over a ledge, it will either get thrown off course or break. Even with the edge mode the mower still leaves a little bit of work for you to do, mainly around fences and walls. So you’ll need to do some trimming every so often. If your garden is separated into different areas and they aren’t linked then you’ll have to carry the mower about. This might be an annoying task but it’s certainly a lot less annoying than carrying a full size, push mower to do the same thing! 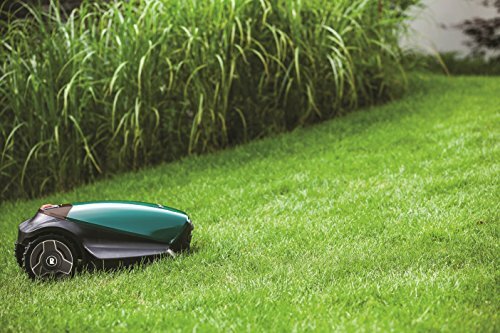 The RC308 is a truly great lawn mower. It can be used in a family environment, can maintain up to 6 different areas and can be controlled by the palm of your hand. It’s reasonably priced and produces one of the most accurate cuts out there, so is great value for money. All of its features make it completely versatile, so no matter the shape of your garden, it will be able to handle it. I am positive you’ll fall in love with this machine once you’ve seen the results it produces – seen from your deck chair I may add! To help you understand if you’re suited to the RC308 model, run through the list below to see if you’re compatible with it. Hopefully I’ve made this process at least a little easier than it was before but if not just drop a comment below. I want to help you out as much as I can so feel free to answer me anything. Cheltenham Mowers Ltd (Lawnmowers UK) is a family-run business with many years of experience of selling, servicing, and repairing lawnmowers, mowers, garden tractors, lawn tractors, brush cutters, hedge trimmers, chainsaws, garden vacuums, garden shredders and all other types of garden machinery – whether for domestic or professional use. This looks like the dream mower! 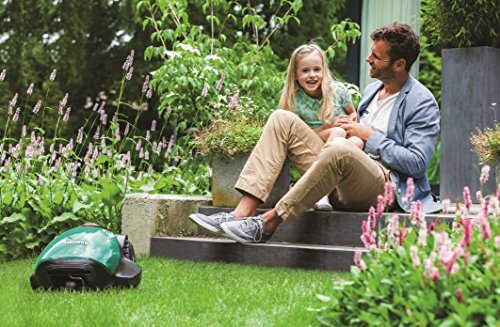 I had no idea there was a robotic lawn mower but I bet every dad out there would want this. I live in an apartment so I have no means for this but I would definitely consider if I had a lawn. Thanks for a good read and informing me on some sweet new technology. I’m glad you enjoyed the review! Yeah maybe they aren’t for you quite yet but maybe something to think about in the future? They really are cool machines so definitely consider them. Thanks for the comment and be sure to ask me if you have any questions. Yes! I definitely need one of these. I am very lazy when it comes to mowing the lawn, and this looks like the my dream come true. Imagine not having to worry about mowing the lawn, and yet keep your lawn looking it’s best at all time. I can see this product being very poplar with many home owners. Yeah they really are great. It’s not only that they take so much time and effort off your hands but also because they do a much better job. Over a good couple of weeks you’ll seem huge changes in the look of your garden, it’ll look greener, healthier and just a whole load better! I’m glad you enjoyed the review and very grateful for your comment. You convinced me to buy one of these lawn mowers. You really presented well it’s features and why it is that useful. 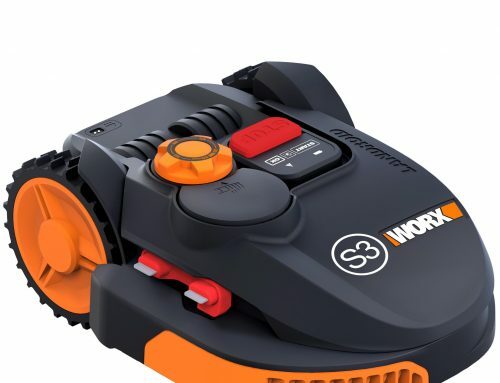 Moreover, Robomow RC308 is environmentaly freindly and it does his job better than any other lawn mowers. 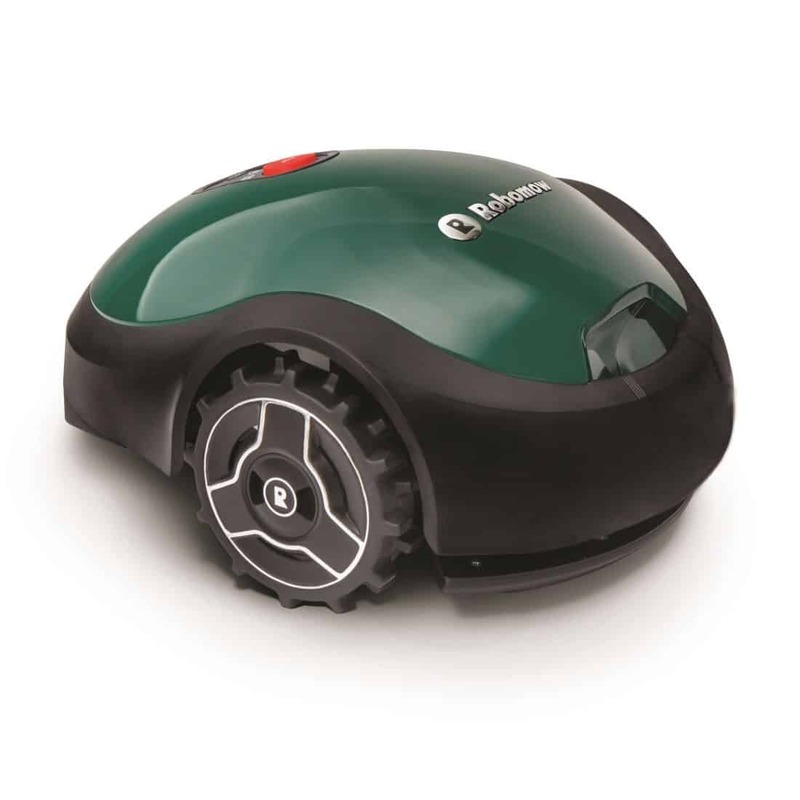 It is a great and useful robot for the garden! Thank you for the information it was useful! There is one essential parameter missing from your reviews: how narrow paths they can cut. And the Robomow RC308 (which we have now) need 2 full meters between wires. We didn’t investigate this fact before purchase, and it actually means it doesn’t work in our garden. We have several “islands” (flower beds) where there isn’t 2 m between, and we have a 10 m long grass path between two sections of garden that is only 1.2 m wide. The Robomow can’t travel that path (neither cutting it nor even just using is as transport way). Robomow support is worthless, they don’t even understand my explanations, so no answers from them with possible workarounds. So now we’re getting rid of the Robomow RC308. 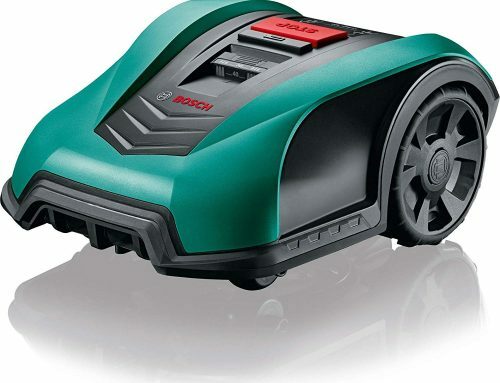 The Bosch Indego 350/400 by comparison needs only 0.75 m between two wires, so it’ll be able to cut much narrower paths. So sorry to hear about that Steen, I’ll make sure to add this information to my reviews to make sure no one else has to go through what you have. Thanks for the comment, I really appreciate it! Hi we have just installed the RC308 and we have a 1.2m wide path between the main garden and an orchard, we were able to follow the instructions in the manual “Setting a narrow path” and the robomow is able to navigate the path. I found that the instructions needed a bit of tweaking. We ended up with the two wires in the narrow path about 60cm apart (not 50cm as instructed) and the ingoing wire used to setup two 30 cm square islands, one 50cm from the start and and the other 50cm from the end of the path, leaving 30cm on either side of the wires which was sufficient for the robomow (30cm-[outgoing wire]-60cm-[incoming wire]-30cm). It also seems to be important to have the wires going in and out of the narrow path at sharp right angles which the mower can negotiate correctly (this caused us some problems at the start by having 120 degree angled wire going into and out of the path). Thanks for the comment John! I’m sure all those in a similar situation will find this very helpful. I guess, sometimes, the instruction aren’t always right!